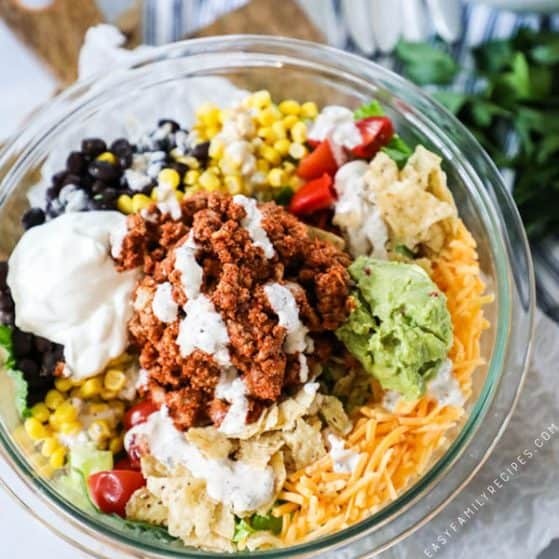 This Taco Salad is a classic recipe that is super EASY to make and LOADED with flavor! The Mexican flavors in this wholesome salad are a tried and true crowd pleaser. The Taco Salad is hardy enough for a meal, but light enough not to way you down and can be made ahead of time for meal prep. 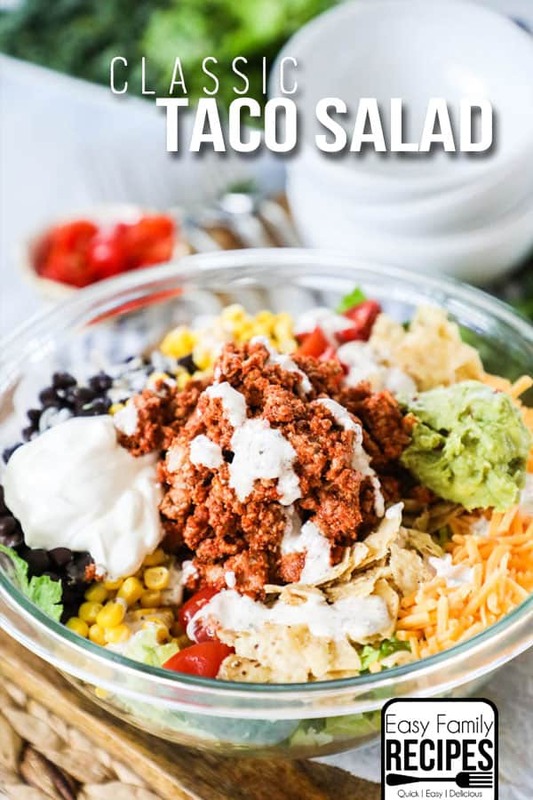 One of my favorite things about this meal is that although you can make the taco meat fresh for this salad, you can also use leftover from earlier in the week to give them new life, or repurpose them for a quick lunch. Either way, you can’t go wrong adding this Taco Salad into your meal rotation. Taco salad has always been a favorite meal for me. It is quick, simple, and filling without being heavy. You can adjust it based on what you have on hand and best of all, it is an absolutely delicious way to use up leftover taco meat you had from another meal earlier in the week. My version of taco salad is pretty classic. It has evolved to my family’s taste preferences, but the great thing about it is that you can easily adjust the add ins for almost any diet such as gluten free, dairy free, low carb, etc. 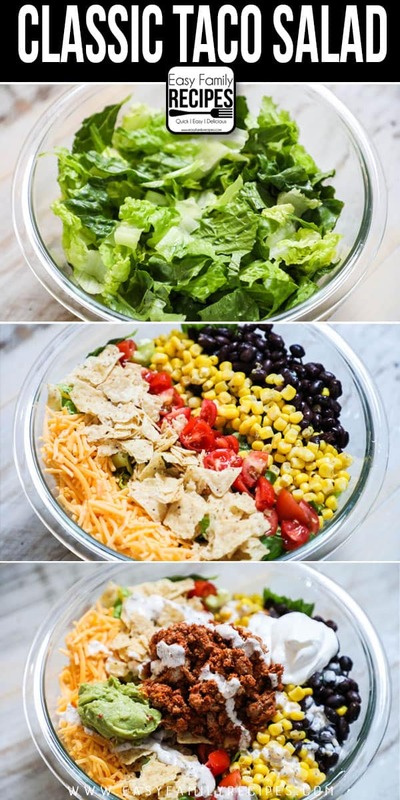 I usually make the salad in a big bowl and toss it right before serving, but if you do have special dietary it is also really fun to serve “salad bar” style to let everyone add their own toppings to customize their taco salad to their own dietary needs and taste preferences. One of the key ingredients in Taco Salad is obviously taco meat, of course. I recommend my favorite taco meat in this recipe, but there are a few options for substitutions if you prefer something different. Store packet- You can easily make taco meat with a seasoning packet from the store. Just follow the ingredients on the package to prepare and then jump back in the recipe. Premade taco meat- Although I wouldn’t say it is readily available, you can find pre-made or precooked taco meat in specialty stores sometimes. If you have leftovers from making tacos, you can save it to make this meal later in the week or month. To do this, store the taco meat in an air tight container and store in the fridge for 3-4 days or in the freezer for up to a month. I am going to share some of my tips and notes with you here to help answer any questions that may come up while cooking. 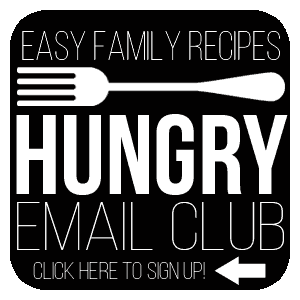 For the FULL printable recipe card, make sure to hop down to the bottom of this post. 6 cups chopped romaine or iceberg lettuce– You can use either or a combination of both. More classic salads use iceberg since that is what you would traditionally find on a taco but I really like the taste and texture of romaine, so that is what I usually use in my salad. If you have both, a mix is really great! 1/2 cup crushed tortilla chips- Traditionally at restaurants taco salad is served in a fried tortilla shell. That is super fun (and delicious) but for my at home version, I skip the hassle (and calories) of the big fried shell and just crumble tortilla chips up to give the salad some crunch and replicate the taste of the taco shell. 1/2 cup sharp cheddar cheese- Sharp cheddar is my preference since I feel like you get the most flavor from it so you don’t have to use as much cheese, but you could also use a colby jack, mexican blend, or other varieties of cheddar. 2 cups taco meat– I highly recommend you make this with my taco meat recipe! It is so delicious and really is what makes this salad truly special. 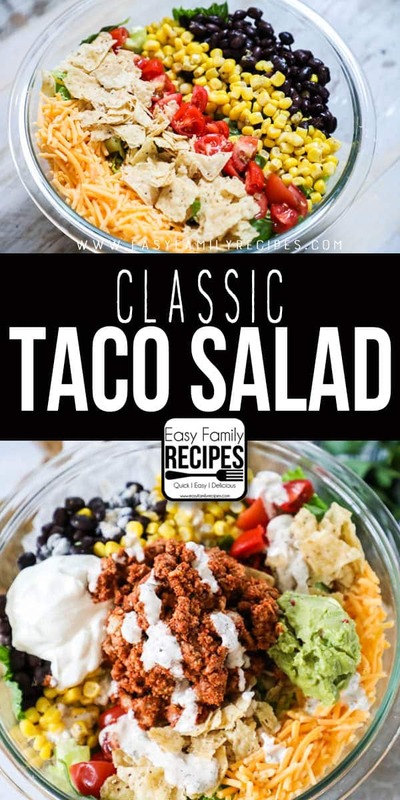 It is quick and easy to make and you can even freeze it so you can have it to make meals like this taco salad quickly anytime! 1/4 c Ranch – try my homemade ranch or dairy free ranch here! 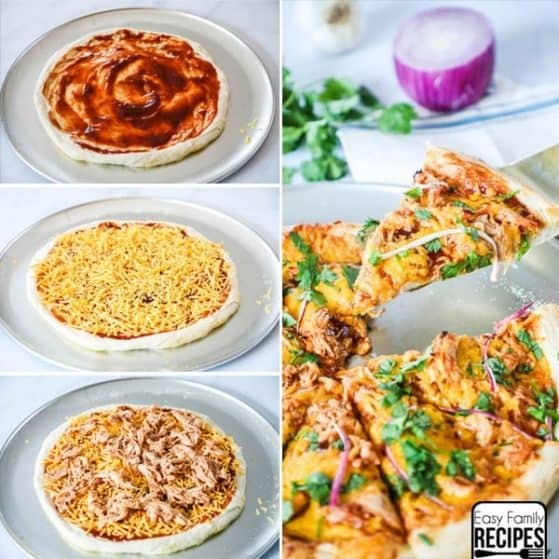 These recipes are both some of the top recipes on my site for good reason. 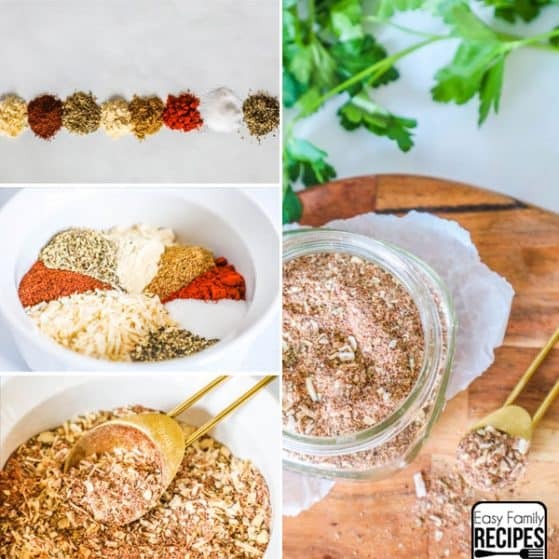 If you have never made homemade dressing, no fear! You won’t believe how easy it is and how much better than bottled they are! This is a staple in my fridge! 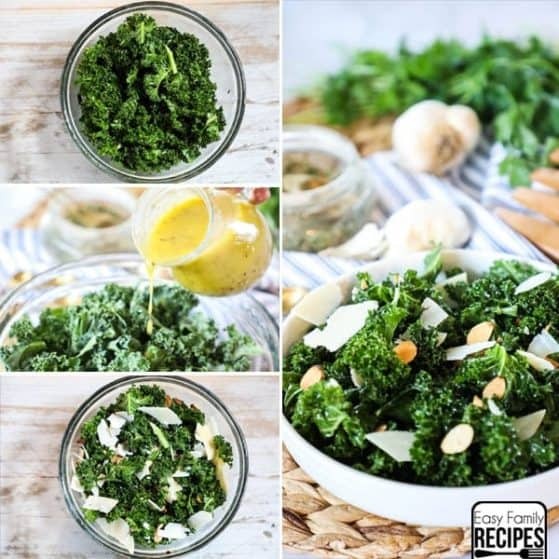 This recipe makes about 6 side salads or 4 larger salads. Only add the chips and toss with dressing right before serving. 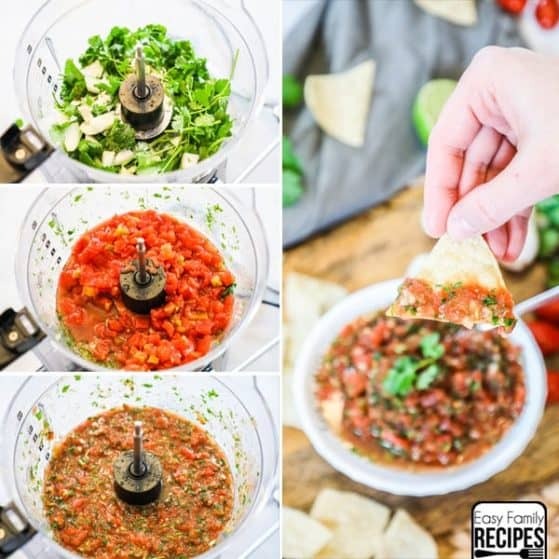 If you plan to not eat the whole dish, and would like to save the leftovers, I recommend dividing the salad up before you toss with the dressing or salsa and then just add the dressing, salsa, and chips to each individual serving as you are ready to eat it. As long as you keep the chips and dressing separate, you should be able to save the salad in the refrigerator for 2-3 days. Feel free to get creative with the toppings! You can add some not on the list, or take off toppings you don’t enjoy as much. It is up to you and you don’t have to worry about messing it up. Salad is forgiving in that way! I really hope that you enjoy this recipe as much as we do! This (along with taco night) will be on regular rotation now that summer is here and we need quick and easy meals! This taco salad is packed with delicious Mexican flavors and is a crowd favorite. Make it from fresh or leftover taco meat for a quick and easy lunch or dinner. 1/4 c Ranch - try my homemade ranch or dairy free ranch here! Both are SO GOOD! Arrange lettuce in the bottom of a large bowl. Layer black beans, corn, cherry tomatoes, and cheddar cheese on top. If serving immediately also add tortilla chips. If not, save the chips to add right before serving. Immediately before serving toss salad with equal parts ranch and salsa until everything is lightly and evenly coated. 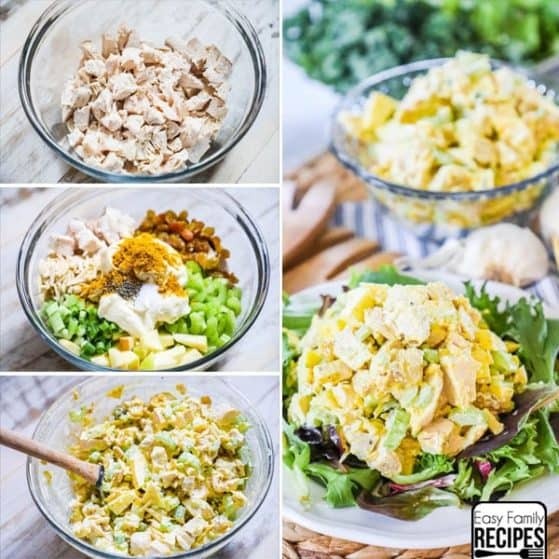 Add more or less dressing to taste. Serve onto dishes, and top with your choice of sour cream, guacamole and chopped cilantro. Enjoy!